The names of Provincial Grand Masters of West Lancashire don’t often appear on the roll of Presidents of the annual festival of the Emulation Lodge of Improvement. Five appear, to be precise. It took 62 years from the first festival for an invite to a West Lancashire man to be noted, when in 1896 Lord Skelmersdale (later the Earl of Lathom) accepted the presidency. Another 75 years were to pass by before we find Sir Knowles Edge Bart. as the next president. Invitations have become a little more frequent since then with Alan Ferris in 1988, Colin Wright in 2003 and now Tony Harrison in 2019. 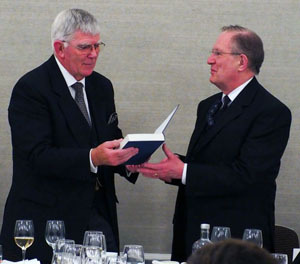 Tony Harrison (left) receives his memento from Graham Redman. No records seem to exist for the level of support enjoyed by the previous West Lancashire presidents but that can be put to right, here. 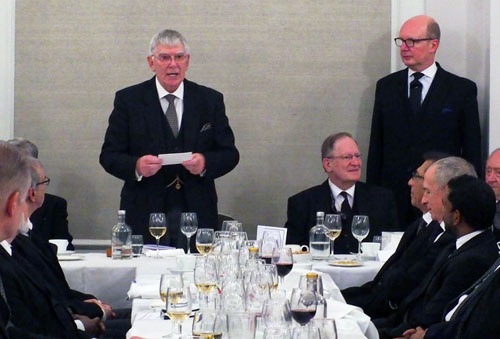 At the festive board there were 174 brothers enjoying a four-course meal. Of those, 95 stood when Tony Harrison took wine with the brethren who had travelled to support him. Over half! That doesn’t tell the whole story, however, as the festival meeting was held in Temple No 10, known as the Indian Temple, which holds 250 people seated. More seats had to be squeezed in to accommodate everyone. With almost everyone standing at their places the principal guests were led in by Deputy Grand Director of Ceremonies Edward Goodchild. These included Tony Harrison and Paul Gower, Provincial Grand Masters for West Lancashire and Hertfordshire respectively, the Deputy Grand Secretary Graham Redman, the Deputy Provincial Grand Master of West Lancashire Philip Gunning and several Assistant Provincial Grand Masters, along with many other senior grand, Metropolitan and Provincial grand officers. On being settled in their chairs, salutations to the festival president were led by Edward Goodchild. The main work of the festival then proceeded with Stephen Roberts of Grove Park Kent Lodge No 2824, Kent Lodge of Instruction, delivering the third section of the second lecture. This was followed by John Lovatt of Campbell Lodge of Instruction, London, who delivered the fourth section of the second lecture. 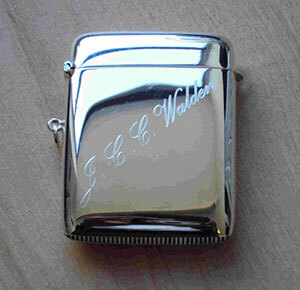 The third lecturer was Arthur Lea of the Fylde Group Lodge of Instruction, West Lancashire. He delivered the first section of the first lecture. The final work was given as Colin Howard delivered the seventh section of the first lecture. This award is no mean feat, even for the finest ritualists. Some of the keenest brothers have more than one scratch on their matchbox and a very small group have the whole set of four. Arthur Lea of Quingenti Lodge No 8516 is one of that elite group who have achieved the full set. There are only 10 brothers alive who have attained that distinction. The evening was rounded off by a fine banquet in the famous Connaught Rooms, where over half of the diners hailed from the Province of West Lancashire. Here the President of the Festival expressed his honour and pleasure at having been invited to preside over the festival this year. He also expressed his particular pride in having been supported by so many of his West Lancashire brethren. On completing his response to the toast to his health, proposed by Paul Gower, Tony was presented with a bound history of the Emulation Lodge of Improvement, signed and presented by Graham Redman. Tony Harrison (left) responding to the toast to his health. For some, this day began before dawn with significant numbers arriving at Wigan and Poulton-le-Fylde, where coaches were waiting to take local brethren to the capital city to support the Provincial Grand Master. However, we must not forget those who travelled from Barrow-in-Furness, Lancaster, Southport, Chorley, Preston and every other West Lancashire group. During a Masonic year Tony Harrison will attend many lodge and chapter meetings in what are known as ‘team visits.’ On this occasion it seemed like he was leading a double team visit, along with his deputies and assistants from the Craft and Chapter cabinets. At the end of a very satisfying day out, many made their weary way home on their coaches, some of whom didn’t arrive home until nearly 4am the following morning. Their journey home however, was all the more enjoyable by Tony Harrison boarding the bus before departure and thanking the brethren for their support. Some members, however, stayed in hotels throughout London and apparently the parties carried on into the small hours. A reasonably late start the following morning, in glorious sunshine, put a fine end to a splendid occasion. Members from the Fylde on their arrival at Warwick for a lunch break.